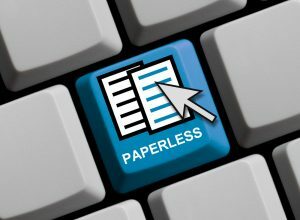 Home / Blog / Have you thought through your go-paperless process? The paperless workplace movement has been around for a fair while now, and rightly so. After all, trees don’t grow on… erm… well, you know what we mean. It just isn’t sustainable to keep hacking down forests so we can scribble a short note on an A4 piece of paper and then toss it in the bin when we’re through with it. The environment will eventually go off in a huff and we’ll be left to try and survive an eternal winter eating nothing but foraged mushrooms or something equally unpleasant. But while going paperless is great as a concept, it’s actually something which should take a bit of thought if you want to achieve good results. Especially if you’re running a larger or more established business where any change is likely to take a degree of effort to implement. This is by far the most important part of any change management process. Get it wrong, and with all the will in the world you just won’t succeed. Even if you threaten to fire people for using more than 2.5 sheets of paper a day, how are you going to police that? The best way to ensure that your mission to go paperless succeeds is to make it everyone’s mission. Except more fun than that. Because if it’s going to be a ‘mission’, no one will do it. The point is, get buy in before you do anything else. The best way to get people on board with something new is to make it super easy – ideally easier than what they’re doing now. Most of us are pretty lazy at heart. Or just super busy. If your paperless system involves new hardware or software – whether that’s tablets to replace paper order forms, a file-sharing system like Dropbox or GSuite, e-signature software, or something bespoke – make sure everyone understands how to use it so that they actually do use it. This might involve investing in some training. Do it. It will be worth it. Just like the filing cabinets of yesteryear (ah, nostalgia! ), online filing systems need to be clever. It’s no good leaving everyone to rely on a search function. There needs to be a system of clearly defined folders and subfolders, with uniform labelling protocols for the documents they contain so no one gets confused. Again, there might be the need for some training on this and you’ll almost certainly need to circulate some guidelines otherwise people are likely to end up very confused. And confused people tend to lose stuff, even if it is in the Cloud somewhere rather than an archive room. In order to make a paperless system work, you’ll need to have people outside the company on board too. Look at where your incoming paper is coming from. Can you ask your suppliers to send electronic invoices instead of paper ones? Are there any unnecessary circulars you can unsubscribe from? Have you gone for the paperless statement options on your bank account? If something doesn’t need to come to you in a paper format then make sure it’s changed to an electronic one. As a bonus, you’ll have a lot less mail to file. While your staff may be on board with the idea of going paperless, they’re only human. On those occasions where they do have to print something, they may well forget to tick the “print two sided” option, for example. By setting protocols on your printers, you can make sure that single sided has to be a deliberate choice rather than an absentminded mistake. Likewise you can use the analytics from your printers to see where the bulk of the printing is coming from, whether that be individuals or departments, so you can focus your efforts to reduce paper use in those areas. If you’re looking at going paperless and you want to talk to someone about scanning your documents or even destroying the ones you no longer need, get in touch today to see how we can help.